One if by land, two if by sea, three from within. The America that our founding fathers and countless millions have fought and died for is under attack. Not by some foreign aggressor but from an ideological mindset and post modern worldview. We have lost our moral compass and are in danger of loosing our liberties and freedoms. As was once true during the American Revolution, the church stood as the center of political debate and the church leaders were instrumental in rallying the masses in their fight for liberty. The time has come again for the church leaders to assume their rightful roll as leaders of the community and make a stand for freedom. The entire Christian community must now unite in opposition to the erosion of our founding principals and return this nation back to the divinely inspired constitutional precepts and values that facilitated Americas rise to greatness. 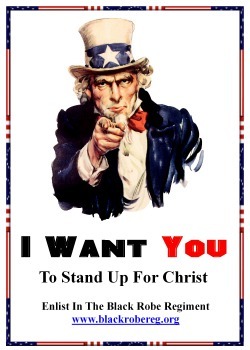 We are calling on all church leaders to join with us in building a united community of constitutionally minded and Christ based patriots willing to push back against an overreaching federal government. Please join the Black Robe Regiment and invite others in as well. Use the resources and initiatives here to educate, motivate, and activate your congregations into action. Time is running short and we must awaken and make our stand and have our voices heard!! Church leaders can submit a request to join HERE. All Christians and concerned patriots can join HERE.